As a digital camera user, you still want a hard copy of your digital photos, but home photo printing is expensive, difficult and time-consuming. After all the effort, you still may not get the quality that you need. ART-TEC PRINTS provides high quality, low cost digital photo printing on KODAK paper (glossy or matte) If you do not have your own design, you can use one of our holiday card designs and add your personal touch for FREE. They are unique and we encourage you to add your own photo and a personalized message. Send your wishes to your friends, relatives, clients and prospects on cards printed exclusively for you. We transfer your cherished photos to canvas! We can turn your favorite photo into a stunning work of art. Using a revolutionary digital printing process, we will reproduce your photo on canvas and stretch it onto a wood frame if you prefer. All for amazingly low prices. Take all the best images with your digital camera, and transfer them onto your PC. 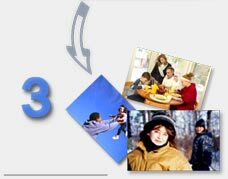 Prepare your images, then Upload them using our easy online Upload Tool for photo printing. Enjoy your great quality digital prints delivered to your door.